There has been a lot of discussions regarding the bride and groom first look. What most people seem to forget is the father daughter first look. The daddy-daughter first look is also a very important occasion. We can all agree that a father seeing his daughter dressed in her bridal finery is an emotional moment for both parties. Typically, every one of these dad’s first look moments is filled with smiles, laughter, love, and even happy tears. 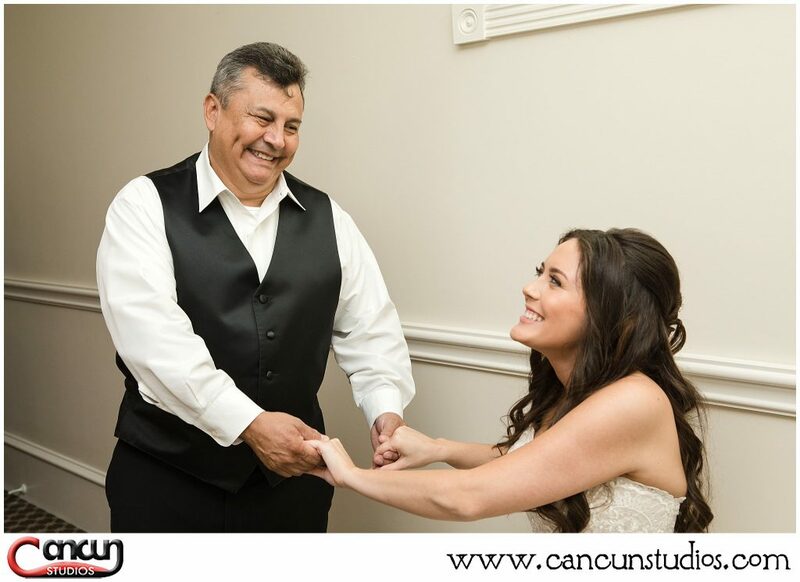 If you are new to the idea of the daddy-daughter first look, you might be wondering why it is important for your Cancun wedding photography. Let’s answer this question for you. Your wedding day will be full of activities and moments. This means that if you don’t plan a dad’s first look before the big day, you may never have time to connect with your dad in a meaningful and honest way before you become someone’s wife. The first look with dad will offer you a chance to talk to each other and also be open with your emotions since you aren’t in front of an audience. This will offer you two time to have an emotional connection. Remember, a wedding usually happens only once in a lifetime. 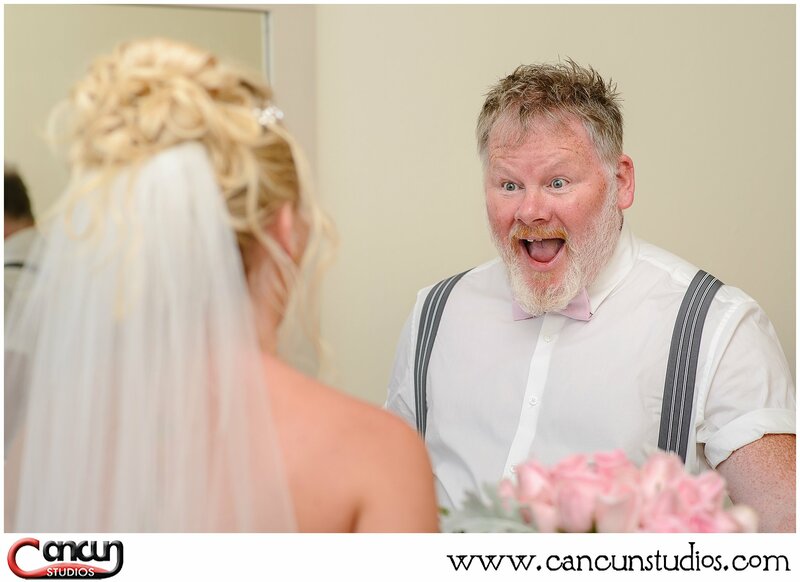 However, when you capture the dad’s first look, you will get to see the pictures and remember the emotional connection you two shared just before you got married. The good thing about father-daughter first look is that it does not require too much planning. 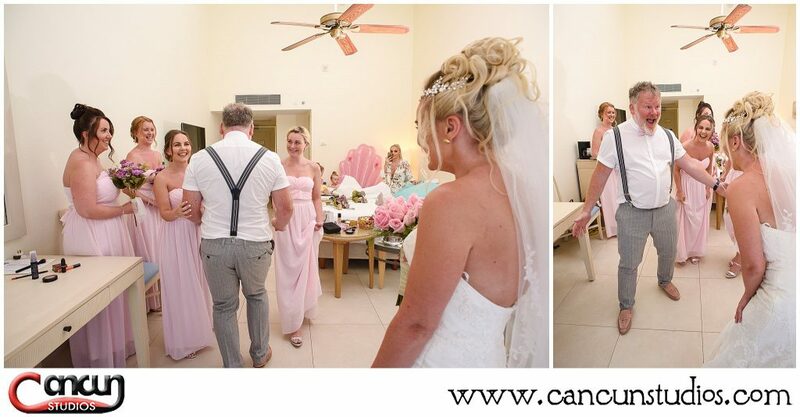 The first thing you will need to do is make sure your photographer is aware that this moment is important to you. You should also ensure that the photographer knows where this moment is happening in order to ensure that you don’t miss it. The next thing you will have to do is ensure the place where the father-daughter first look will be taking place is ready for photos. You should ensure that the outdoor space and the actual room does not have any clutter. Now that you have prepared your photographer and the place where the dad’s first look will be taking place, the next thing you need to focus on is yourself. You should ensure that you are wedding-ready on your father-daughter first look day. You should have your hair styled, your makeup on, and you should have the wedding veil in place. This is to make sure that your dad gets the full wedding effect. This will make him react appropriately. During the father-daughter first look, you will want to have a genuine experience so your photos can capture the true emotions. Have fun with the moment and don’t hold back. Tears make for the best photos.